Writing this blog involves a lot of research and reading. Many of the tidbits I learn along the way make it into various blog posts, while some anecdotes are tucked away for later use. Today, I'm sharing some of my favorite "secrets" of jewels owned by British royals. Feel free to add your own favorite stories in the comments below! When she was Princess of Wales, Queen Alexandra was one of the most fashionable ladies in all of British society, and everything she wore was quickly emulated and copied. She unwittingly started a trend for wearing choker necklaces; she actually wore the chokers to cover a scar on her neck. Most of the oldest pieces in the current Windsor collection are from the middle of the nineteenth century -- and for good reason. In 1858, Queen Victoria lost a legal battle against her cousin, the King of Hanover, over a number of older jewels that had belonged to Victoria's grandmother, Queen Charlotte. 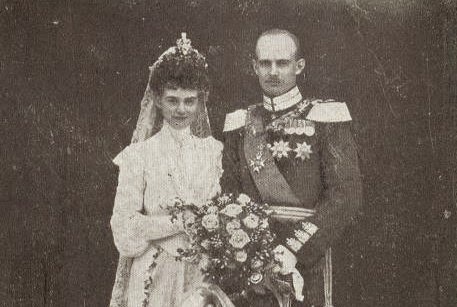 The diamonds in question were removed from the British vaults and shipped over to Germany; some of them, including a tiny diamond nuptial crown (pictured above on Grand Duchess Alexandra of Mecklenburg-Schwerin), are still with the Hanoverians today. Until Colonel Blood's infamous attempt to steal the crown jewels in 1671, visitors to the Tower of London were actually allowed to slip their hands between the wooden bars of the display and touch the royal regalia. Elizabeth I of England and Mary, Queen of Scots were both cousins and enemies. Elizabeth gained the upper hand over Mary in terms of both power and jewelry. Along with having Mary imprisoned and executed, Elizabeth also managed to secure Mary's coveted black pearls for her own collection. Some sources say these are some of the pearls that Elizabeth wears in the famous "Armada Portrait." On her wedding day in 1947, Queen Elizabeth II paid tribute to her grandmother, Queen Mary, by wearing her diamond fringe tiara. But before she could leave for Westminster Abbey, the tiara frame snapped and had to be hastily repaired. 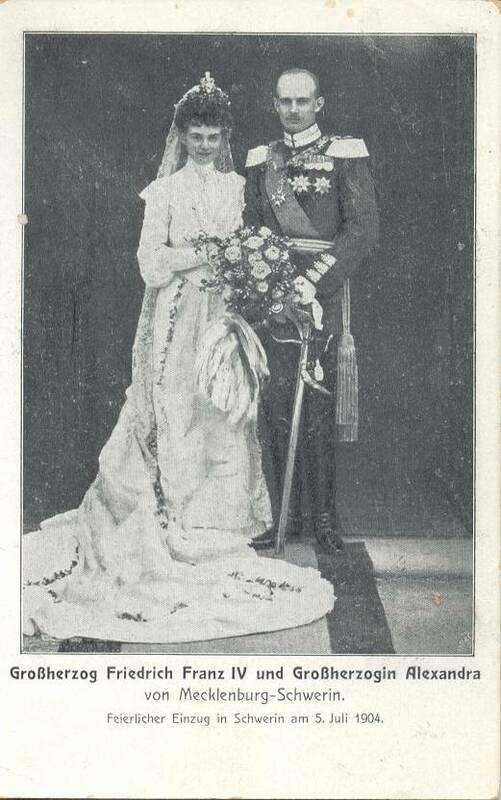 If you look closely at Elizabeth's wedding pictures, you can see that the tiara is uneven! The famed Black Prince's Ruby, reportedly worn by Henry V at the Battle of Agincourt in 1415 and set in the Imperial State Crown today, isn't actually a ruby at all -- it's a spinel. It's also one of the royal gems that managed to survive Cromwell; a jeweler bought it after the execution of Charles I and sold it back to his son, Charles II, when the monarchy was restored. The Duchess of Cambridge wore one of the Queen Mum's tiaras on her wedding day in 2011, but her wedding jewelry also included a sly reference to her own less-than-royal background. Her diamond earrings included small acorns -- designed to echo the acorns on the coat of arms that her father was granted shortly before her royal wedding. Around ten versions of the Imperial State Crown have been made and worn since the monarchy's restoration in 1661. The current version dates to 1937, though it was altered and adjusted for Queen Elizabeth II in 1953. The crown is also apparently the piece of the crown jewels which most often needs to be maintained and repaired by the crown jeweler. One of the Prince of Wales's hobbies is reportedly purchasing jewelry for his wife, the Duchess of Cornwall, that was once owned by her great-grandmother, Alice Keppel. Alice was one of the mistresses of Charles's great-great-grandfather, Edward VII. A number of pieces of British royal jewelry are resting at the bottom of the Mediterranean Sea. In 1911, Princess Louise, Princess Royal and Duchess of Fife was sailing with her family to Egypt. Their ship wrecked off the coast of Morocco, and although the family managed to escape, a case of Louise's jewels washed overboard, never to be seen again.